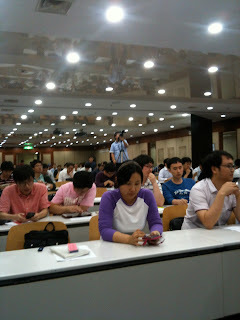 Yesterday, there was a OSS App Hackathon arranged by the NIA (National Information Society Agency) in Seoul. I attended as a panel of judges w/ Prof. Lee of the Next, NHN University. A lot of people were in there. Recently, Hama core committers Suraj Menon and Thomas Jungblut are working on Fault-tolerant BSP system. And I am trying to read the source code. Their design describes the new BSP computing system and API enabling checkpoint-based recovery. Furthermore, describes the confined recovery, which can be used to improve the cost and latency of recovery. I didn't fully understand and test yet but quite nice!